Health Ministry officials said that 43 percent of deaths in the Kingdom in 2014 were caused by non-communicable diseases, a figure which is expected to rise. According to a joint press release between the Ministry of Health and the World Health Organization on World Health Day 2016, which Khmer Times obtained yesterday, there is clear evidence that the rates of four non-communicable diseases – diabetes, cancer, heart disease and chronic respiratory disease – are increasing. 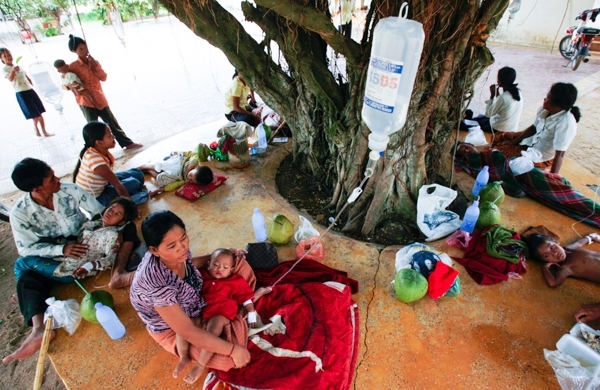 “Collectively, these four diseases caused 43 percent of deaths in Cambodia in 2014, up from 35 percent of all deaths in 2011. And this figure is projected to continue rise,” the joint statement said. Ministry of Health Dr. Mam Bun Heng encouraged the Kingdom’s citizens to adopt a healthy lifestyle to combat non-communicable diseases. By achieving and maintaining a healthy body weight, being moderately physically active for at least 30 minutes on most days, adhering to a healthy diet that includes fruit and vegetables and a reduced sugar intake as well as avoiding tobacco use, one can combat the four deadly non-communicable diseases. Dr. Chhun Loun, chief of the non-communicable disease office at the Ministry of Health, told Khmer Times yesterday that patients who had the diseases account for 46 percent of all cases throughout the Kingdom, and theses can be transmitted from generation to generation. “These four disease cause similar difficulties such as cancer. But for diabetes, it is a kind of disease that has no cure, but that the patients do not die quickly of,” Dr. Loun said, adding that all four diseases are preventable with lifestyle changes. “Some citizens have poor habits with their eating, especially if they drink too much alcohol, which can have a bad effect on their health. Most of our people like eating salty foods, do not like eating vegetables and fruit and like eating a lot of oil, which is not good for their health,” she said.